My son Samuel was born with Lobar Holoprosencephaly, Diabetes Insipidus, Seizure Disorder, Cerebral Palsy, Panhypopituitarianism, and Adrenal Insufficiency. He is graduating on June 4th from Penn Cambria High School in Cresson, Pennsylvania. In Pennsylvania special needs students can attend school until they are 21 years old. He has been in this school district for 16 years. One of my biggest fears when he started school was the possibility that he could be made fun of or bullied. I didn’t want him to be picked on or bullied by other students because he was different. After all, it was not his fault he was born with so many medical problems. In the past 16 years at this school district we have never had issues with him being bullied or picked on. He has been treated like a ROCKSTAR by administration, teachers and students. He has been treated with respect, love, and kindness. He has been at the high school in the learning support class for the past six years. He has an aide that has gone to school with him every day for the past five years. Her name is Carol and she takes care of him like he was her son. He has been in the same homeroom for the past 6 years at the request of his teacher. He has had the same wonderful speech therapist, for the past 12 years. These teachers are exceptional. They have always been encouraging, caring and supportive toward my son. He loves them too!! He lights up when they are around. The students in my son’s class are the best!!! They have been with Sammy for many years. I have seen together and they are true friends. I have seen many “fist bumps” and “high-fives” when I am at the school and walk down the hall with Sammy. The students in his class have been able to look beyond his disabilities and get to know who he is as a person. After talking with some of them I think they have found that even though he is unable to talk, he is quite funny and charming. When I see them interact I know they see him as a true friend and it warms my heart. In my eyes Sammy’s teachers and friends couldn’t get any more supportive and kind. In March a wonderful group of young ladies in his senior class took kindness to a new level when Sammy brought a letter home from with an invite to the prom. Every senior deserves to be at prom for this very special occasion. The class of 2016 is a “family” of which Sammy is a big part. No one could decide who would be lucky enough to go with you [Sammy] to prom, so will you go with all of us? We would be so honored. His older brother and I were crying as we read the letter. Sammy didn’t have just one girl ask him to the prom, he had 37 GIRLS invite him to the prom!!! A few weeks later all the girls gathered in the gym to ask Sammy to the prom. When Sammy walked into the gym they were all lined up holding signs that said, “Will you go to prom with us?” Sammy smiled and gave them a thumbs up. Sammy’s father and I had to attend the prom with him due to all of his medical problems. 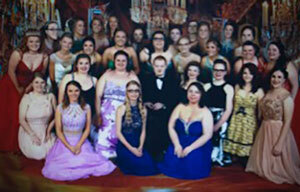 We met with the senior class before the prom for pictures. He had many beautiful girls asking if they could have a picture with him. One memory of the day that really sticks in my head happened when they were taking a group picture. Sammy has been having issues with extreme weakness in his legs. During the group picture he just sat down on the step because he couldn’t stand any longer. One of the guys came down and gave Sammy his hand and helped him get up. He led Sammy to the middle of the group and had him sit on the step right up front. Then he and another guy crouched down with him. I believe they did that so that he wouldn’t feel out of place. There were many adults there but nobody told him to help Sammy. He knew why Sammy sat down and just came forward to help him. We arrived at the prom just in time for the promenade. They announced each couple as they walked up on stage. After all the couples were announced, they announced Sammy and his dates. They all escorted Sammy to the stage as the entire room cheered. Sammy usually does NOT like to be the center of attention. Tonight was different. He stood proudly beside is dates with a big smile on his face. After pictures Karingtin came and got Sammy and took him to their table. Karingtin is the wonderful person who organized the whole thing. Sammy never leaves our side and my husband was a bit shocked. I knew he was in good hands and proudly let him go to have a great time. As my husband and I stood on the sidelines with the other chaperones I was in awe to see how all the students interacted with Sammy. It was heartwarming to see how the girls interacted with and watched out for him. They made sure he was having fun. He loves music and he loves to dance. He had a steady stream of students coming to find him to dance. He did not once sit on the sidelines and watch except when I made him because he looked a little tired. One of Sammy’s medical problems requires that he drink a great deal of fluids every day and his friends knew that. I watched as they took the time to get him drinks and sit down with him to make sure he was drinking enough. Sammy is non-verbal but understands everything said. He knows many signs but prefers to use his own made up signs. His friends knew what his signs meant and knew exactly how to communicate with him. There was no doubt in my mind that these students were Sammy’s true friends. Sammy had made the prom court and at 9:30 they were going to announce the prom king and queen. I wasn’t sure if he was going to make it till 9:30 because he seemed to be getting weak. The teacher in charge of the ceremony noticed that he wasn’t looking well so she decided to move it up to 9:00. When they called Sammy’s name two of his dates escorted him to the middle of the dance floor. Everyone cheered loudly as Sammy walked onto the floor. They announced the prom queen first and then announced that the prom king was Sammy Lamar. The entire room began to chant, “Sammy, Sammy” as he went up to get his crown. The entire senior class had voted for Sammy to be their prom king. As they chanted his name he proudly walked onto the floor to receive his crown with a big smile on his face. At that moment I was humbled by the kindness shown by every person in that room and the proudest mom in the world. I am very proud of my son. He has been through a great deal of unpleasant things in his short life, but through it all continues to smile. I have always noticed that people seem to be attracted to Sammy. I call him my “people magnet”. I think it is because of his uncanning ability to make people smile. Sammy danced with his queen like a pro, and had what seemed like several hundred more pictures taken. What amazed me was that he was still wearing his crown. The fact that he still had that crown on his head was nothing short of a miracle to me. In his lifetime I have never seen him wear a hat for more than maybe one minute. He wore that crown in the car the entire way home. He never took it off until we got into the house. He was certainly proud of that crown he had received. I wish that before any student bullies another student they would stop and just think about what being kind would mean to that person. One act of kindness toward a person can be life changing. Graduation will be very bittersweet. I am happy and proud to see my son graduate from high school, but at the same time sad to see him leave a place with such wonderful people. Sammy and I will never forget these girls and their wonderful act of kindness. I am sure that these lovely young ladies will go far and succeed in everything they wish to do in life. Lindsey Hunter is a 15-year-old freshman at Folsom High School in Folsom, CA. “Silent” is her first short film. She created it for a Northern CA Media Educator’s Film Contest for which she received first place in the live action short film division. Lindsey wanted to create a film titled “Silent” that was a silent film about a girl living in a silent world and wanted to convey the message, “If you are going to say something mean, remain silent.” Lindsey has grown up around disabled people since her father is blind. In fact, when she first showed “Silent” to her father, Lindsey had to describe each scene to him. The story brought her dad to tears. Lindsey has a genuine heart for those with disabilities. Lindsey is passionate about her interest in creating projects on film. She got her start by creating videos of her sister on her iTouch. Lindsey also loves to perform with El Dorado Musical Theater where she met the girls who starred in “Silent” The redeemed mean girl is played by Julianne Yonano and the deaf girl is played by Jocelyn Haney. Lindsey hopes to get a scholarship to the USC Film School so she can pursue a career in filmmaking. I've been bullied my whole life and its still a part of my life today. It all started to change 14 years ago. I was in the car with my mom and older sister on our way to a dance rehearsal. A reckless driver hit two other cars before hitting us. We then got suspended in a guard rail. I was in the hospital for a while and diagnosed with a servere tramatic brain injury. A brain injury happens when your skull gets fractured and your brain gets injured. You never totally heal from it. Doctors said I would not survive or that I could never walk or talk again. But, they were all wrong. I have trouble understanding things and my memory isn’t that great and sometimes other kids can tell. I have a lot of doctor appointment throughout the week and people ask why and is something wrong with me. I’ve been called so many names and usually crying in my room after school. I have been called stupid, dumb, freak, weak, and the one I hate the most is retarded. I hate when people use this word because it hurts so much. even in high school, it’s really hard going to school every day. In my freshmen year, I would constantly get physically attacked. I didn't tell anyone. one day, my dad noticed scars on my arm and that was when the truth finally came out. Now I’m stronger and confident. Instead of my parents ending it, I wish I could of. I know I can stand up for myself to anyone. You just have to be brave. If I can do it, so can you. If you see someone getting bullied, stand up for them. Don’t be afraid. speak up and be strong. I promise you it will make you feel a lot better. Always remember you’re not alone. I believe in you. Be strong. Be brave. Be fearless. Just be you. When Connor experienced bullying at school, he turned to his favorite country artist for comfort. Being able to sing along with Rich Cloke’s song “Wanting You” brought this young boy with Tourette Syndrome delight. 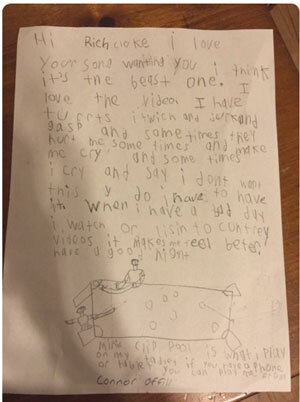 To thank Rich for all the happiness his song had given him, Connor sent him a wonderful letter. I love your song wanting you I think it’s the beast one. I love the video, I have turrts, I twich and jurk and gasp and sometimes they hurt me. Some times they make me cry and some times I cry and say I don’t want this. Y do I have to have it. When I have a bad day I watch or lisin to country videos it makes me feel better. Have a good night. This message touched Rich, as he saw the joy his music brought Connor after experiencing bullying. In response to this meaningful message from Connor, Rich decided to reach out with an amazing message of his own. Hi, Connor, it’s Rich Cloke, and this is a special message just for you, because you’re an awesome guy. Your letter meant a lot to me. And I was blown away by the video of you singing along to “Wanting You”. Living with Tourette’s can be a pretty big challenge, especially when you get bullied. Kids bully for all sorts of reasons. But, know this, it’s not your fault and you don’t deserve to be treated that way. There are people you can count on for support, like your mom, your friends, teachers and other adults, and it’s good to ask them to help. There are lots of people who care about you, and now I’m one of them. I’m really proud to have a fan like you, Connor, and you should be proud, too. I want you to stay strong and believe in yourself. And when you get sad, remember that you’re not alone and that everything is going to be OK. Hang in there, little buddy! This powerful story shows that bullying is truly a community issue, as it involves students, parents, educators, and even country artists! When we all stand together, no one has to stand alone.